Danish-German Siemens Wind Power and Italian Enel Green Power have won the tender to construct five wind farms in Morocco. 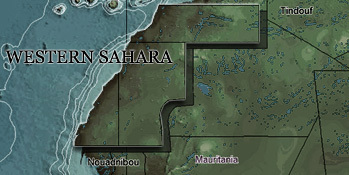 Only, two of planned farms are located outside of Morocco, and inside occupied Western Sahara. WSRW had warned them from taking part in the tender. Photo above: Siemens mills arrived the port of El Aaiun in occupied Western Sahara in March 2013. Moroccan news paper L'Economiste ran the news that the consortium of Siemens Wind Energy, Enel Green Energy and Nareva has won the tender issued by Morocco's national electricity agency ONEE back in early 2012, to construct five wind farms with a combined power of 850MW. Two of those wind farms will be located outside of Morocco's internationally recognised borders, and in the threequarters of the Non-Self Governing Territory of Western Sahara that Morocco holds under military occupation since 1975. WSRW already reported on the planned wind energy projects in its 2013 report "Dirty Green March". Several other media outlets report the news of the Siemens-Nareva-Enel win, although ONEE itself has not yet made an announcement on its webpage. However, the news can be considered credible. Out of the five consortia that were still in the running, Siemens and Enel were the only ones to combine forces with a Moroccan company, Nareva - a company owned by the SNI holding, property of Morocco's royal family. An anonymous sources confirmed the news to Bloomberg. The Moroccan royal family is profiting largely on businesses in Western Sahara both on renewable energy, and in the plantation sector. WSRW has on several occasions asked Siemens whether they have sought the consent of the people of the territory. WSRW has also asked Siemens and Enel specifically not to take part in the tender they have just won. Enel never responded. Siemens has always dodged the question. The European Union's failure to take into consideration the people of Western Sahara in its free trade partnership the Moroccan Kingdom made the Court of Justice annul the EU-Morocco trade deal last week. The same illegality would necessarily be the case with Siemens' plans in Western Sahara without seeking the consent of the Saharawis. The two plants that are planned to be built in occupied Western Sahara have a combined potential of 400MW: a 300MW plant will be erected in Tiskrad, near Western Sahara's capital city El Aaiun. Another 100MW plant will be constructed near Boujdour, located along the mid-coast of the occupied territory. Siemens Wind Energy is a wind turbine manufacturer established in Denmark in 1980 as Danregn Vindkraft, later known as Bonus Energy. Bonus Energy was acquired by the German multinational conglomerate Siemens in 2004. Enel Green Power is an Italian renewable energy corporation. The entire 850 MW programme comes with a price tag of an estimated €1,24 billion. Moroccan media claims that there are already financial engagements from the European Investment Bank, the African Development Bank, the European Union and the German government-owned KfW Bank. Commissioning of all five wind farms, including the two on occupied land, is expected in the 2017-2020 time slot. The entire program is part of Morocco's ambitions to have 42% of its electricity capacity come from renewable resources. With regard to wind energy, the objective is to reach 2000MW capacity by 2020. Almost a quarter of that target capacity will come from wind farms in occupied Western Sahara. Morocco announced at COP21 that it has set a new target of 52% electricity from renewable resources for 2030.